For a magical look that will leave your little one with stars in her eyes, you’ve got to check out the Speedo Fairy Frill Toddler Girls’ Tankini in Fairy, Penelope, and Watermelon! With watermelon coloured frills around the waist and accent straps along with a rainbow of fairies flying around for a bewitching pattern, this look is as cute as the come! First started way back in Bondi Beach near Sydney, Australia in 1928, Speedo is the world's top-selling swimwear brand. With ultra adorable looks like the Speedo Fairy Frill Toddler Girls’ Tankini in Fairy, Penelope, and Watermelon, it’s easy to see why the world is in love with Speedo. 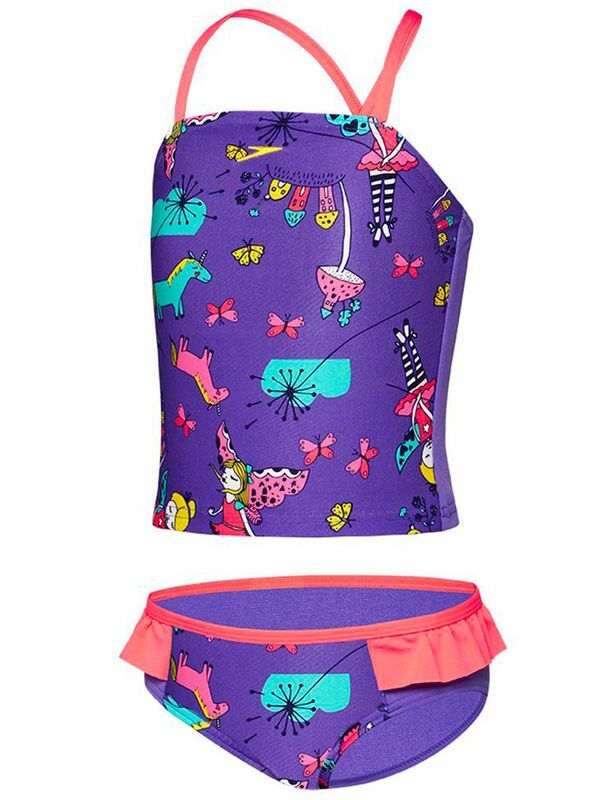 Fairy Toddler Girls Tankini Set manufactured by Speedo Swimwear the worlds leading swimwear brand. Speedo is passionate about life in and around the water, creating revolutionary new technologies, designs and innovations.